On Monday, April 22nd, the RFC lost one old friend and I found out about the passing of another. They are both on my mind. During the summer of 1990 my wife Elli and I, along with a small group that evolved into the RFC’s initial Board of Directors, planned to launch our granting fund. We arranged for a “Kick-off Benefit Concert” that was scheduled to take place in October. I utilized my national contacts to line up the performers. 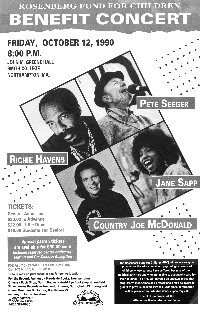 Richie Havens was one of the first people I contacted and he graciously agreed to perform for free.